Introducing a geometric view of fundamental physics, starting from quantum mechanics and its experimental foundations, this book is ideal for advanced undergraduate and graduate students in quantum mechanics and mathematical physics. 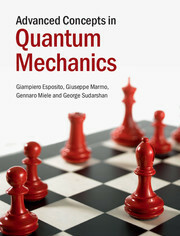 Focusing on structural issues and geometric ideas, this book guides readers from the concepts of classical mechanics to those of quantum mechanics. The book features an original presentation of classical mechanics, with the choice of topics motivated by the subsequent development of quantum mechanics, especially wave equations, Poisson brackets and harmonic oscillators. It also presents new treatments of waves and particles and the symmetries in quantum mechanics, as well as extensive coverage of the experimental foundations. Preface; 1. Introduction: the need for a quantum theory; 2. Experimental foundations of quantum theory; 3. Waves and particles; 4. Schrödinger picture, Heisenberg picture and probabilistic aspects; 5. Integrating the equations of motion; 6. Elementary applications: 1-dimensional problems; 7. Elementary applications: multidimensional problems; 8. Coherent states and related formalism; 9. Introduction to spin; 10. Symmetries in quantum mechanics; 11. Approximation methods; 12. Modern pictures of quantum mechanics; 13. Formulations of quantum mechanics and their physical implications; 14. Exam problems; Glossary of geometric concepts; References; Index. Giampiero Esposito is Primo Ricercatore at the Istituto Nazionale di Fisica Nucleare. His contributions have been devoted to quantum gravity and quantum field theory on manifolds with boundary. Giuseppe Marmo is Professor of Theoretical Physics at Naples University. His research interests are in the geometry of classical and quantum dynamical systems, deformation quantization and constrained and integrable systems. Gennaro Miele is Associate Professor in Theoretical Physics at the University of Naples 'Federico II', Italy. His main research interests are primordial nucleosynthesis and neutrino cosmology. George Sudarshan is Professor of Physics in the Department of Physics, University of Texas, Austin. His research has revolutionized the understanding of classical and quantum dynamics.